The first batch of ten Britomart class of gunboats, an improved version of the Dapper class, was approved in November 1859 and the second batch of six followed in October 1860 with another four of this batch approved in March 1861. The boats of the second batch (suspended until 1862/3) were constructed at Haslar gunboat yard and consisted of Cherub, Netley, Minstrel, Orwell, Cromer, Bruiser (Bruizer). They were all barquentine rig with square sails on the foremast only. 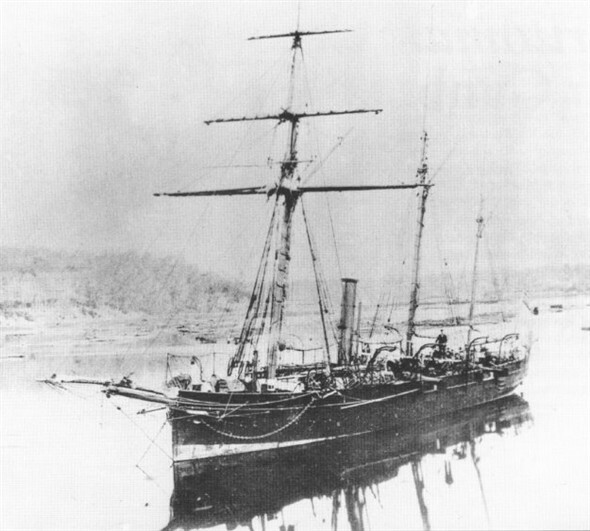 In February 1865 the first, 'Minstrel' was launched at the yard. It was 120ft in length 22ft in breadth and of 268tons. Her armament was expected to be two Armstrong 110 pounders and two small howitzers. Her sister ship 'Cherub' was launched at Haslar in March 1865. Bramble, Crown and Protector had previously been cancelled whilst on the stocks at Portsmouth in 1863 and the order for Danube was cancelled before she was laid down. Netley was built at Portsmouth in July 1866, Orwell in December 1866, Bruiser in April 1867 with Cromer in August 1867. All were armed with two 68 pounders, (later two 64pr R.M.L. guns). The history of HMS Tyrian really begins in 1859 when the Admiralty placed orders for 20 gunboats, initially known as "Improved 60HP Gunboats" which were built to replace the "Dapper" and "Gleaner" classes that had proved themselves in the Crimean War. Their shallow draught (6'6") made them ideal for operations against the Russians in the Baltic and Black Seas. twenty orders placed, ten were to be built in private yards and ten in Portsmouth Dockyard. Due to a shortage of seasoned oak following the Crimean War the builders were authorised to use any available timber, some of the less scrupulous builders even using "green" unseasoned timber. This led to rot setting in to many of the ships which was not helped by the fact that more than half of the 16 completed were laid up on slips at Haslar, Portsmouth as reserve. When built they were armed with two 68lb smooth bore cannon weighing 95 cwt each. These were mounted on swivel mounts midships to maintain stability and fired through gates in the ships side. These were replaced in 1867 with 64lb Armstrong rifled Muzzle Loaders weighing 64 cwt each. As these Gunboats usually travelled in company with larger ships it was customary to transfer the guns to the larger ships to improve handling at sea. Power was by sail and by a 60 nhp Horizontal Trunk engine of two 21" dia cylinders running at 90psi built by Penn of Greenwich or Maudsley, Son and Field of Lambeth. These gave a speed of around 9 knots. Due to the short life of many of the class, the engines were sold on when the ships were broken up and only one of these engines is known to have survived. It was fitted to the SS Xantho which was wrecked off western Australia. The engine was recovered in the late 1990s and is now in the western Australian Maritime Museum. Of the 16 boats of the class which were built, only 4 outlived HMS Tyrian. HMS Britomart which was one of these ended her days as a dock in Dagenham where she was finally broken up in 1946. 14 Mar 1861 - Portsmouth. Commissioned for Service in the Mediterranean. 1864 - Mediterranean Station. Reports of Fevers onboard. Number of Cases of Disease and Injury. 30 May 1870 - reported to be in the Golden Horn on the arrival of vessels from the Mediterranean Squadron. 4 Jun 1870 - reported to be departing Constantinople for the Danube. 28 Jun 1870 - arrived outside the bar at Sulina and was to remain there for few days to refit before sailing for Galatz..
26 Sep 1870 - based in the Danube region. 30 Dec 1870 - arrived at Constantinople from the Danube, her departure from Sulina having been delayed due to bad weather. 20 Jan 1871 - arrived Malta from Constantinople and Syra. 2 Apr 1871 - for census, dockyard creek Malta Harbour. 4 Apr 1871 - departed Malta to meet the squadron off Messina. 20 Apr 1871 - paid off at Malta. 21 Apr 1871 - re-commissioned. 4 May 1871 - sailed to the Danube.